Scroll Stitch is a beautiful surface embroidery stitch which has a graceful scroll-like effect. This stitch creates a line of knots on the surface of the fabric, but the smooth look seems anything but knotty. Use this stitch on straight lines and curves, along bands or to outline shapes. Work scroll stitch from right to left. Bring the needle up through the fabric and use the working thread to make a clockwise loop of thread on the surface of the fabric. Inside the loop of thread and a short distance to the right of the originating hole, go down through the fabric (point 1) and come back up to the front just below (point 2). If you are working along a marked line, point 1 should be on one side of the line and point 2 on the other side. Pull the needle through, keeping the loop of thread under the needle. This completes a single scroll stitch. Repeat to the end of the row then bring the needle through to the back. 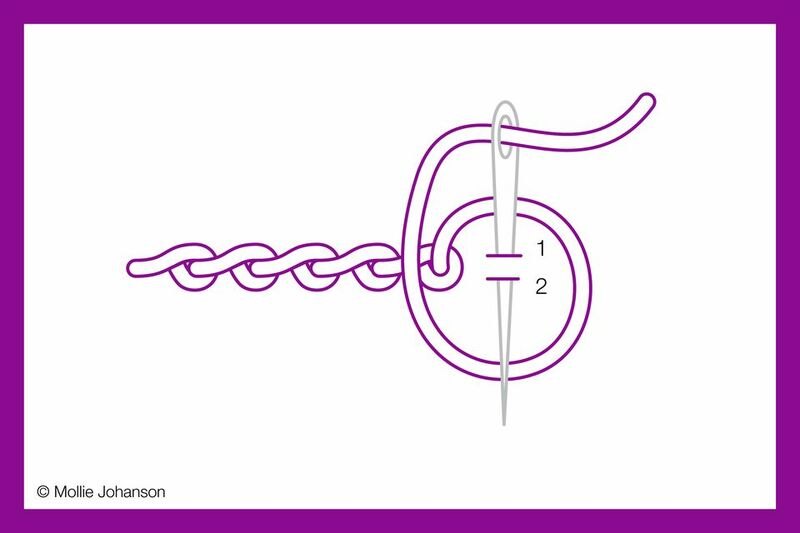 Reverse these directions if you are stitching left-handed. Stabbing Method - The image and instructions above use the sewing method of this stitch, keeping the needle on top of the fabric the whole time. If you prefer, take the needle all the way down through the fabric at point 1 and bring it back to the front at point 2. Make sure you keep the needle on the inside of the loop of thread when you do this. Stitching at an Angle - Change the look of this stitch by bringing the needle through the fabric at a slight angle on the working line. Instead of points 1 and 2 being directly across from each other on the line, point 2 is a little to the left of point 1. Changing the Size - The size of the stitch depends entirely on the weight (or number of strands) of the embroidery thread used, and the tension of the stitch. A looser tension with heavy thread results in more pronounced scrolls. When working with stranded embroidery floss, especially if you are only using a few strands, make sure that it keeps its twist together. When the floss starts to untwist the stitches will look messy. Use scroll stitch to mimic rippling water or waves in the beach or water-themed embroidery projects. In fact, it's suitable for any lines of texture, such as for grass or on trees. Of course, it will always work as a border or edging stitch. When worked as individual stitches rather than a line of stitches, scroll stitch also works for making tiny hearts. Try working this stitch with different spacing to get a different look. Very close stitches have a tight and bumpy appearance, while stitches that are farther apart look more like a scallop. Practice it in a variety of ways to see what style you like for a project.